George Graham Reviews Rani Arbo & Daisy Mayhem's "Gambling Eden"
Since the 1980s, the New Acoustic scene has been stretching the boundaries of music created with bluegrass instrumentation. While genre got its start concentrating on instrumental material, there have been a growing number of groups who carry the eclectic approach of their instrumental brethren to vocal music. This week, we have a stellar example. 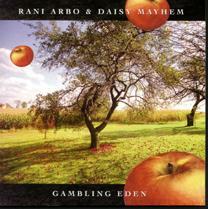 It's the new, second release from Rani Arbo and Daisy Mayhem entitled Gambling Eden. One of the pioneering vocal bluegrass groups to get eclectic was New Grass Revival, one of whose members during the mid-1980s was Bela Fleck. They did their own virtuosic original music, along with a wide range of interesting and unlikely covers from Bob Marley to Bruce Cockburn. Rani Arbo also comes from an eclectic bluegrass background. She was lead singer and fiddle player during most of the 1990s for the New England bluegrass group Salamander Crossing, whose stylistic range was also quite wide. But Ms. Arbo's current group Daisy Mayhem takes a rather different direction. Though Ms. Arbo's instrument is fiddle, Daisy Mayhem features a drummer-percussionist as one of its members, and the group's rhythmic approach runs from swing to funk to old-time folk. and they do some very creative arranging of older songs, some traditional. Ms. Arbo's musical pursuits go back to age eight, when she started on cello, and was also a young chorister at St. John the Divine Cathedral in New York. Her biography lists her involvement with groups including an early music ensemble, a honky-tonk group, a Balkan rock band, and an a cappella group, before joining Salamander Crossing in 1991. A lot of that background can be heard seeping into the Daisy Mayhem group, with its combination of outstanding musicianship and vocals, with a no-holds-barred approach to mixing influences. And unlike some very-eclectic fusionists, Daisy Mayhem's approach is uniformly satisfying, sometimes bringing a whole new light to songs. The rest of this quartet includes another former Salamander Crossing member, Andrew Kinsey, who plays mainly acoustic upright bass and does some vocals. On guitar is Anand Nayak, who also plays a variety of guitar offshoots, and Scott Kessel is heard on what the CD booklet describes as "Drumship Enterprise," a mixture of conventional drums with a cardboard box, a suitcase, recycled aluminum cans and the like. With the big sound of the acoustic bass, which Kinsey plays jazz style, rather than like a bluegrass bassist, and Nayak's ability to lay down a great groove on almost any found object, the result is an intriguing and yet infectious mix. Musical guests include the CD's producer Dirk Powell, who plays instruments ranging from accordion to resophonic guitar to keyboards. Powell says of Daisy Mayhem that as a producer, he basically provided a little guidance, but allowed the group to run with its impulses, and those impulses range from a New Orleans groove to a couple of ballads to Western swing, with five of the twelve tracks being original pieces by one or other of the members. The rest, including the traditional pieces, were obviously the subject of a great deal of thought for the stylistic direction in which the group would decide to take them. Rani Arbo and Daisy Mayhem, on their new CD Gambling Eden have made a very satisfying and creative recording that further widens the boundaries of the amorphous musical region known as New Acoustic music. The group combines the instrumental and arranging strength of the New Acoustic pioneers with Ms. Arbo's versatile and pleasing vocals. Their artistic success in very significantly altering old folk songs is impressive, though that does not diminish the fine original pieces, some of which could pass for traditional songs. While there are some additional musicians added, the bulk of the music, and their arrangements are performed by the band members themselves, allowing them to take their music on the road without losing much. And the Connecticut-based group does a lot of touring, including some recent stops in our area. Unfortunately, sonically, the album is not without problems, in fact, an all-too-common problem. While the instruments and vocals are well-recorded, and the mix puts everything into proper perspective, somewhere, someone along the line fell prey to that old fallacy in the record business that louder is somehow better. So the nice mix was badly compressed, killing virtually all the dynamics of the group's performance, and giving this subtle acoustic group an unpleasant in-your-face sound on many of the tracks, and often distorting the sound of the acoustic bass. For an audiophile grade, we'll give no better than a "C."
Rani Arbo and Daisy Mayhem's previous CD was a little more jazz and swing oriented than Gambling Eden, but the new recording also covers that region as well. This outstanding group grows in both musical ability and creativity on their new release, and continues to show that in creative hands the possibilities for what would seem like a fairly straightforward acoustic lineup are virtually limitless.